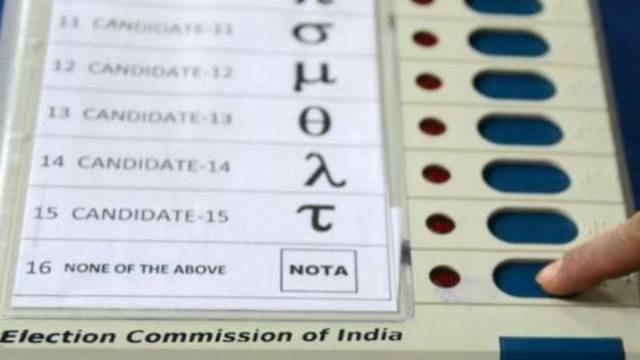 The Election Commission has decided to remove the option of the NOTA from the ballot papers of the Rajya Sabha and the Legislative Council elections. The Supreme Court had issued an order to remove the option of the NOTA from the elections of the Rajya Sabha and the Legislative Council. In direct elections like Lok Sabha and State Legislatures, NOTA will still remain as an option. After the directives of the Supreme Court, the Election Commission has decided to remove the option of the NOTA from the ballot papers of the Rajya Sabha and the Legislative Council elections. The Supreme Court had issued an order to remove the option of the NOTA from the elections of the Rajya Sabha and the Legislative Council. In direct elections like Lok Sabha and State Legislatures, NOTA will still remain as an option. According to the Supreme Court, the implementation of the NOTA in the Rajya Sabha elections seems intelligent in the first place, but if it is investigated, it looks deprived as it has ignored the role of the voter in such an election; this leads to the demoralization of democratic values. The court said, in the beginning, this thinking may look good but its practical use ends the election fairness in the indirect elections. That too, when the voter's vote is worth the price and that price is transferrable. In such a case, the NOTA is an obstacle. The court said that by enforcement of the NOTA in the Rajya Sabha elections, not only affects the discipline given in the 10th Schedule of the Constitution (the provision of disqualification) but also adversely affects disqualification provisions in the law. The electronic voting machine has been given with an option of NOTA (none of the above) which you can use if you do not have your favourite candidate in the election. NOTA has been introduced in 2013 in India after an order passed by the Supreme Court. India is the 14th country in the world to provide the option of NOTA.